Altitudes: 11,200 msl for Carl Engel. Max Lift: 1000 fpm. Carl and maybe others. Tow pilot: Allen White all day long. Thanks, Allen. If you click on any of the photos, it will be enlarged and start a slide show of all the photos. 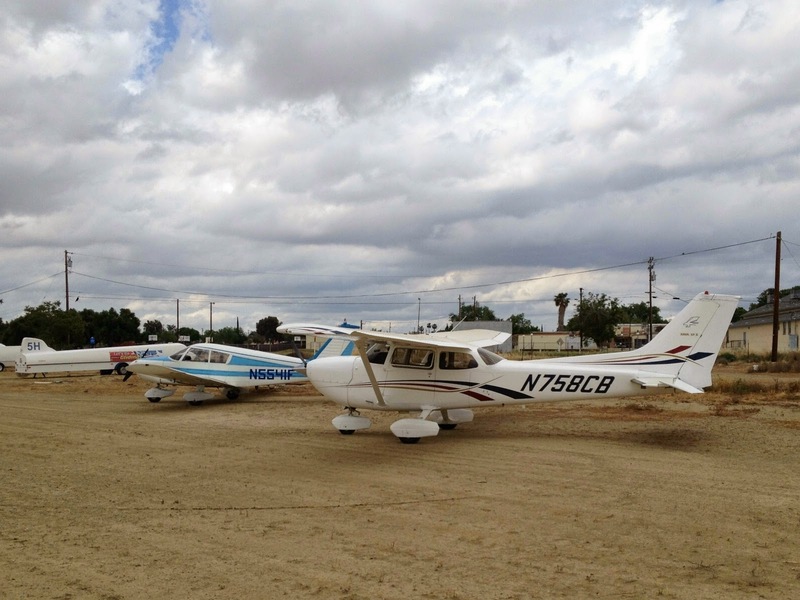 It was a fun day to fly for many members, and new members. 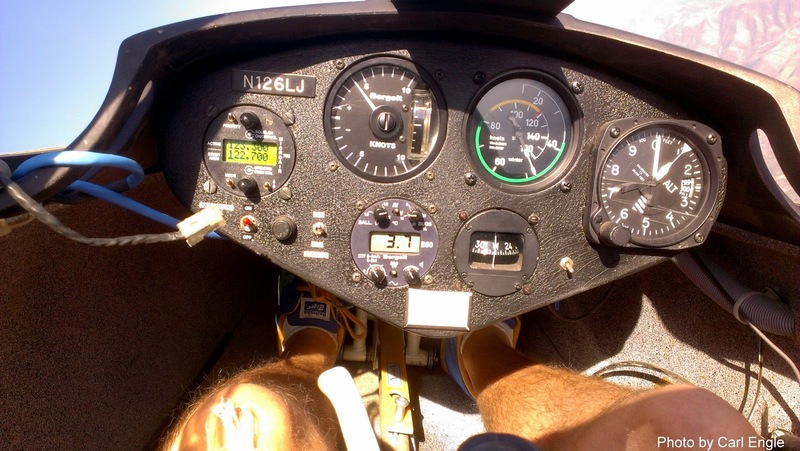 A new solo, new achievements in height, duration, and altitude gain, distance traveled, etc. Many present could claim they did more and better than they've ever done before. Good strong thermals accompanied by good, strong sink made the day a challenge but worthwhile when one centered a good strong updraft. 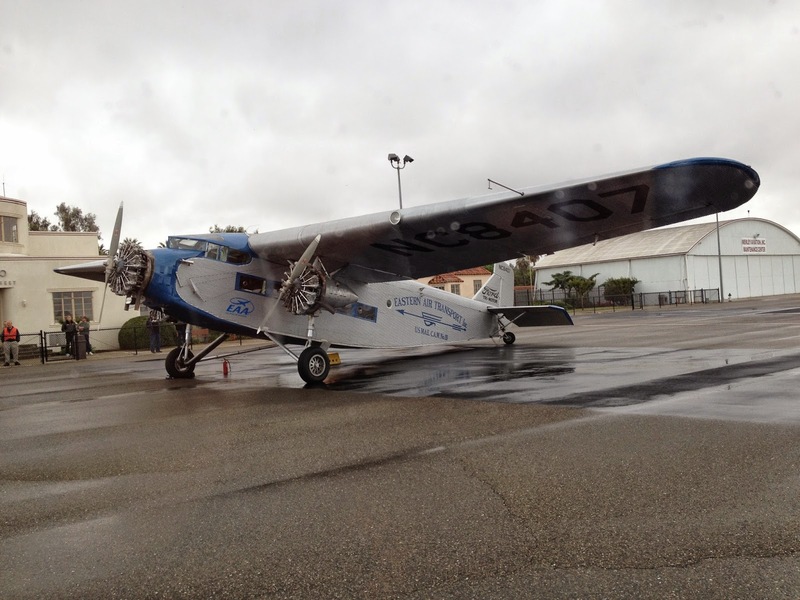 Martin Caskey, Jan Zanutto, and others checked out the 1-26 to see if a reported problem existed with a yaw on tow. It appeared not to be present after a good ground checkout and a test flight. I towed for Martin and brought with me a young man, Ethan Morris, from the coast, the son of a good friend of Jeff Richardson. 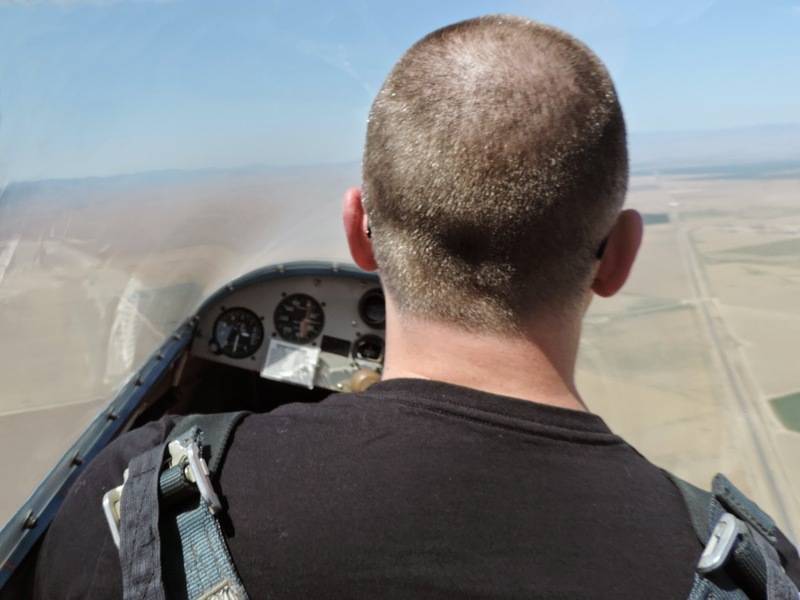 He was excited about being in the tow plane and more excited when I let him handle the controls, which he did with smooth movements. I don't think I've ever seen a smile where the corners of one's mouth went from ear to ear. He was happy, to say the least. 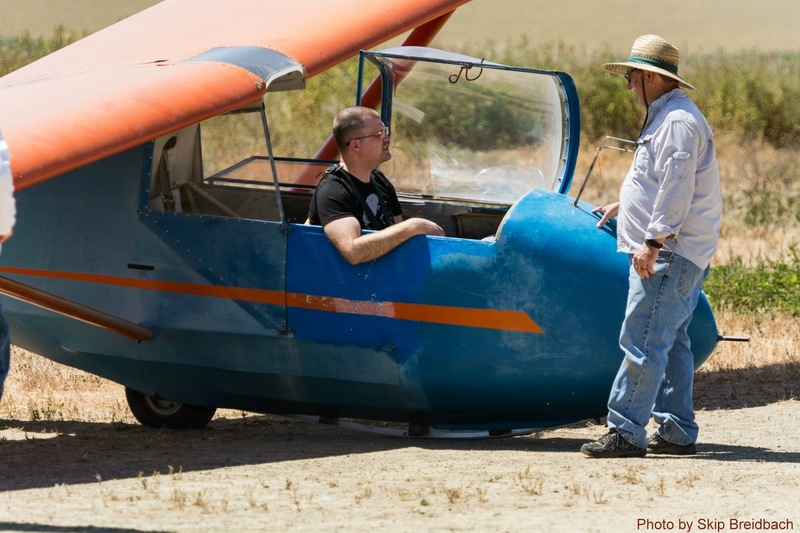 Ethan Morris chatting with Jeff Richardson about his pending glider flight. 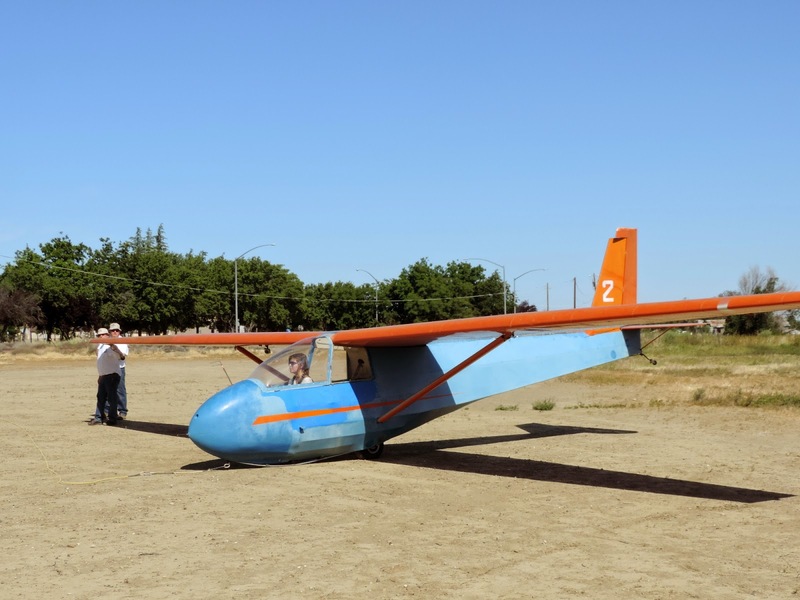 Martin Caskey about to launch in the 1-26 on his test flight. 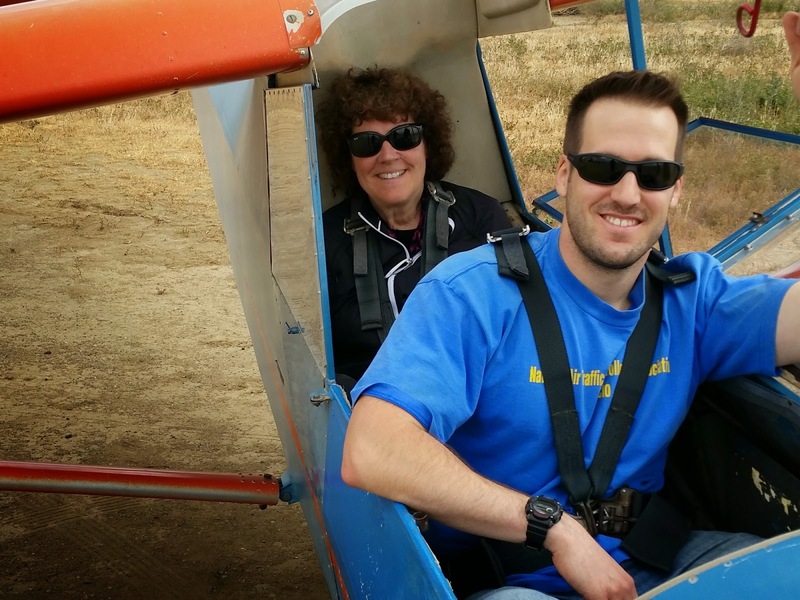 Ethan Morris excited about riding in the tow plane. After the tow of Martin, Allen White took over and towed all day. Next up was Kavin Gustafson who just today joined the club, our newest member. Kavin did very well in air that was beginning to get turbulent. 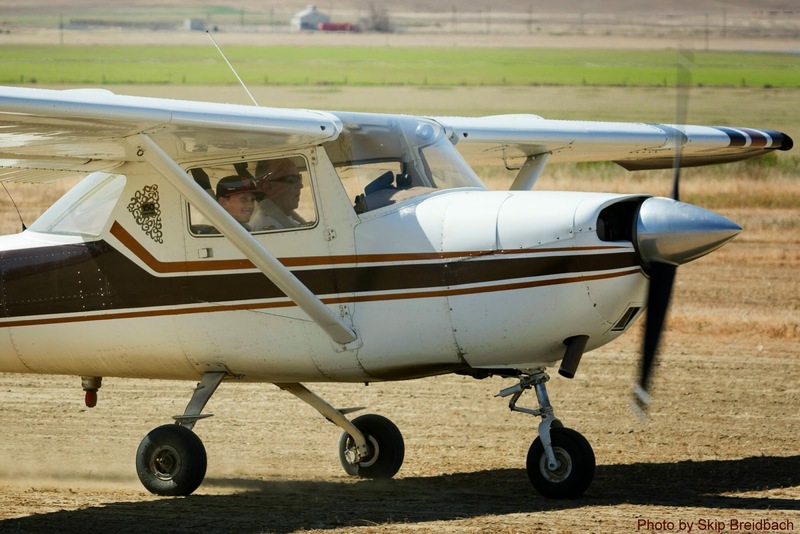 Just his second flight, and off tow he handled the controls with confidence. We were mostly in sink until we headed back to the field about to give up. Then we snagged a good thermal, Kavin thermaled for the better part of 50 minutes, gaining at one time, 1500 feet in one thermal. 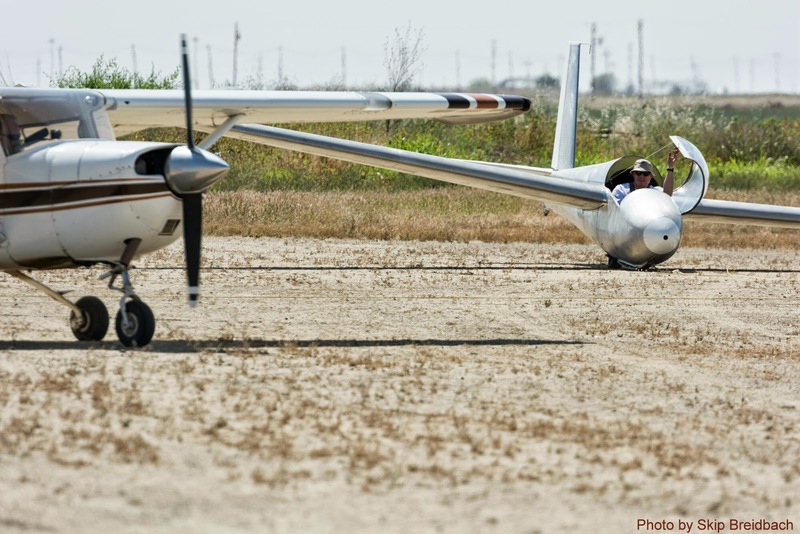 By the time we landed, he had gained a total of 4000 feet in just his second flight. Excellent performance. Kavin waited around until the Orange Crush was no longer needed and we went up for his second flight of the day. On this flight he seemed to pass that barrier from confusion on tow, to understanding and skill at keeping us in position. In addition to that welcome surprise, his stick and rudder coordination improved considerably. He flew well, landed well, and we both look forward to the next few flights. 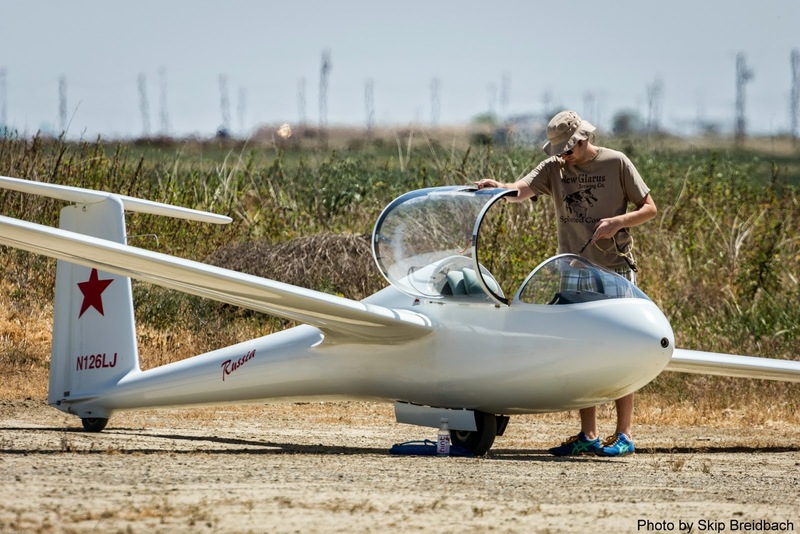 Kavin talking with Mike Paoli before his second ever glider flight. Harold and Kavin aloft searching for good lift. 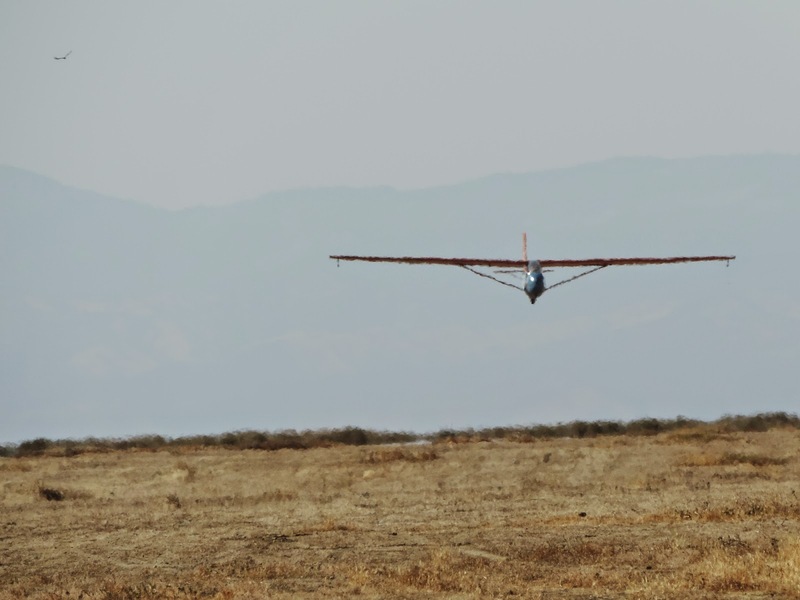 Kavin circling in one of his nicely gained thermals. 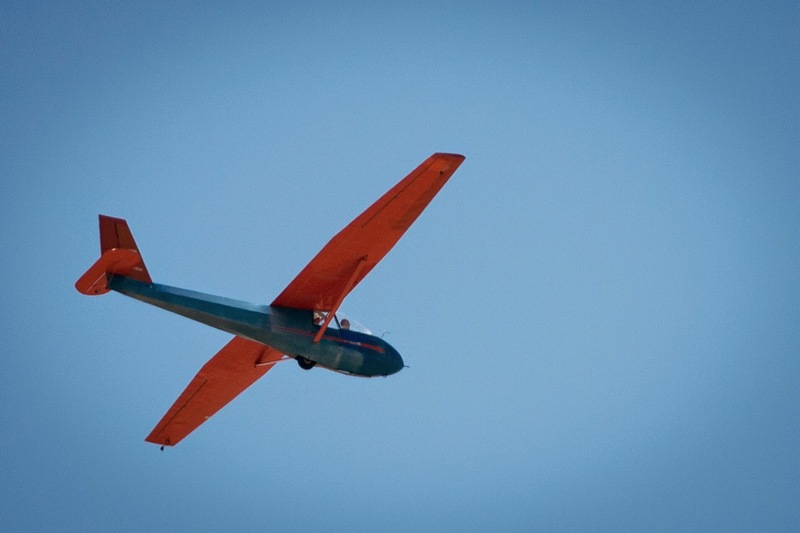 Still aloft and having fun continuing to snag thermals after exiting one after another. There were enough pilots waiting on the patio to keep the Orange Crush busy all day. Jaimie Strickland and Jennifer Bauman were waiting their turn, while Skip Breidbach was packing up to go home after a nice group of photographs shown here on the website. My son, Harold, was working on his self-determined project that will be discussed at the end of this presentation. Waiting for flights or projects or just going home. Jaimie, Jennifer, Harold and Skip. and a half hour in the air. Saturday - there were clouds and this made finding thermals much easier. almost three hours in the air. 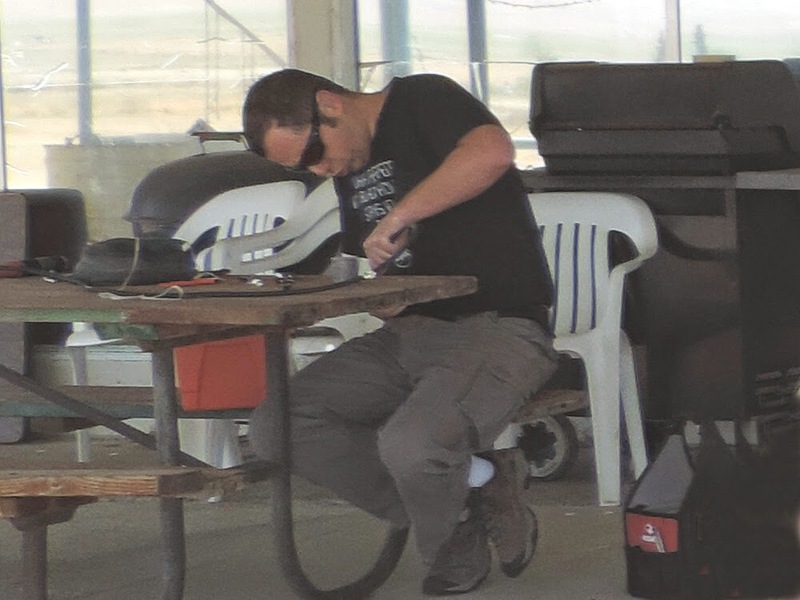 On that same patio, Bart Klusek was quite busy repairing and hooking up our radio antenna. Bart in the 1-26 heading up towards 10, 000 msl. 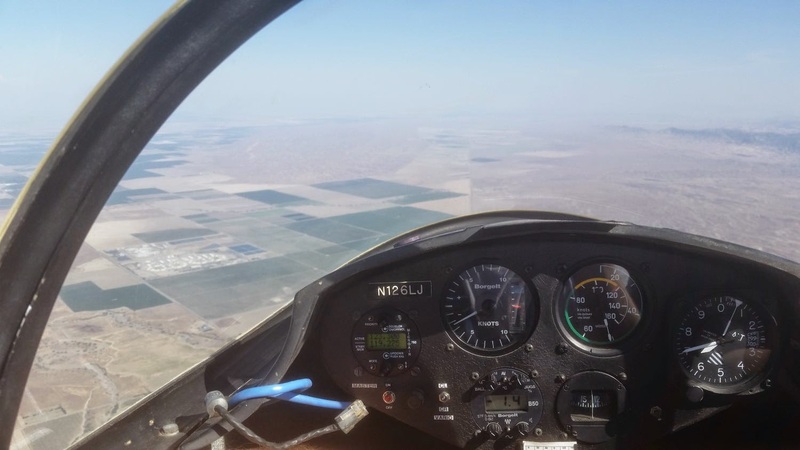 Bart terms this Final Glide but you have to enlarge it to read the instruments. 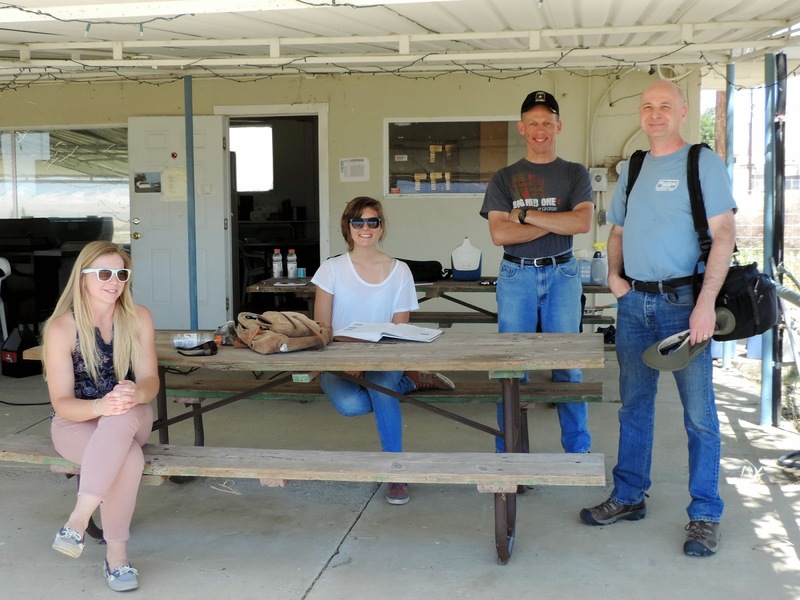 Harry Davies, our very active FA-18 pilot from Lemoore NAS, flew the 1-26 and was aloft a good long time, catching thermals between the low hills and the Kettleman Hills. 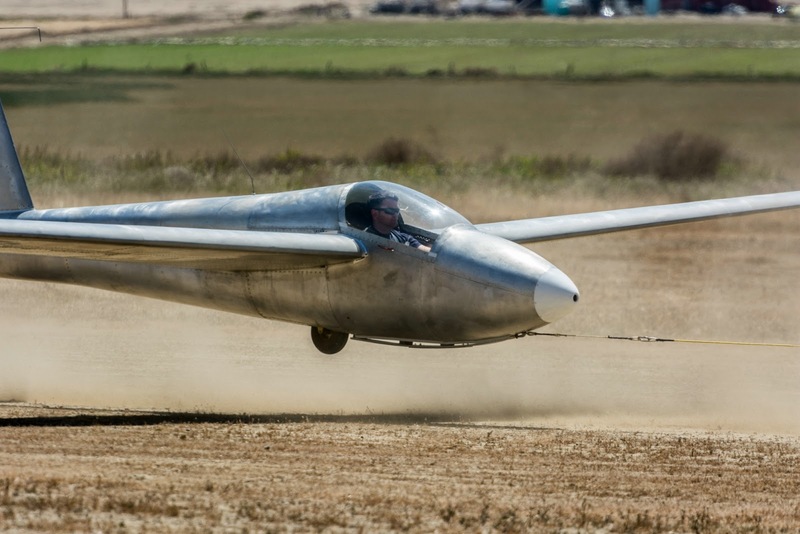 Harry Davies on takeoff in the 1-26. Later on, Harry returned satisfied that he flew as much as he wanted. 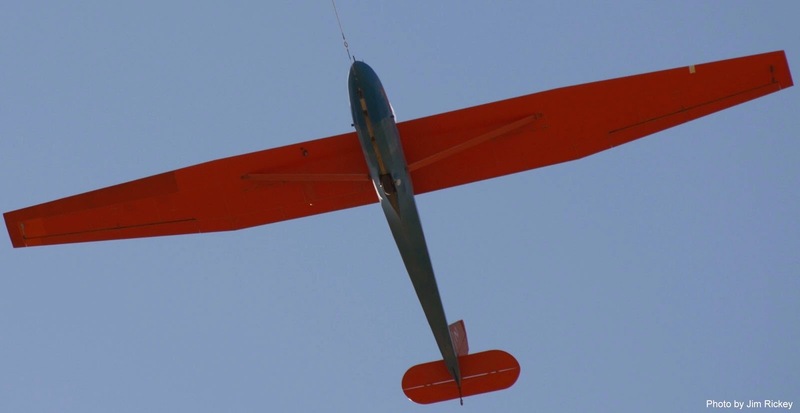 Joe Anastasio launched in the PW-5 and came back more than satisfied. 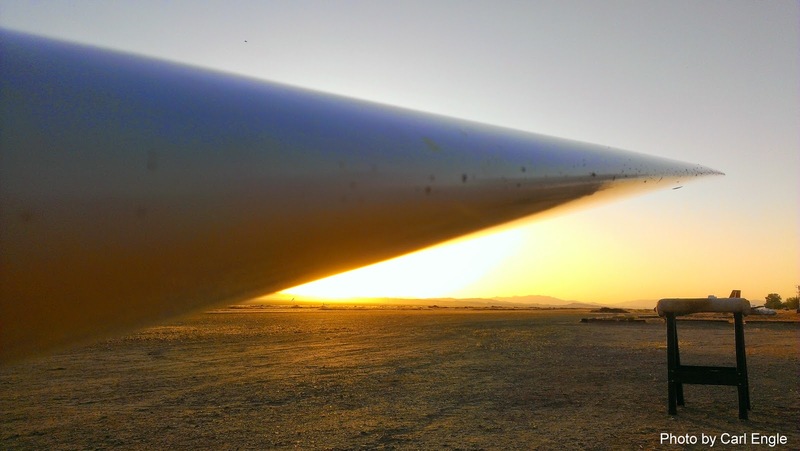 Well above 6000 msl and touring the mountains from north of Coalinga to well south of the Rte 33/41 interchange, then over to I-5 and around the area just having fun and staying aloft. He indicated it was one of his best flights to date.Not sure if he plans on adding his flight to the OLC but check it later. Mike Paoli ran the wing for that excellent flight. Joe Anastasio ready to launch with Mike Paoli waiting to run the wing. Harry Davies recounting his flight to Jaimie, Martin, and Jennifer. 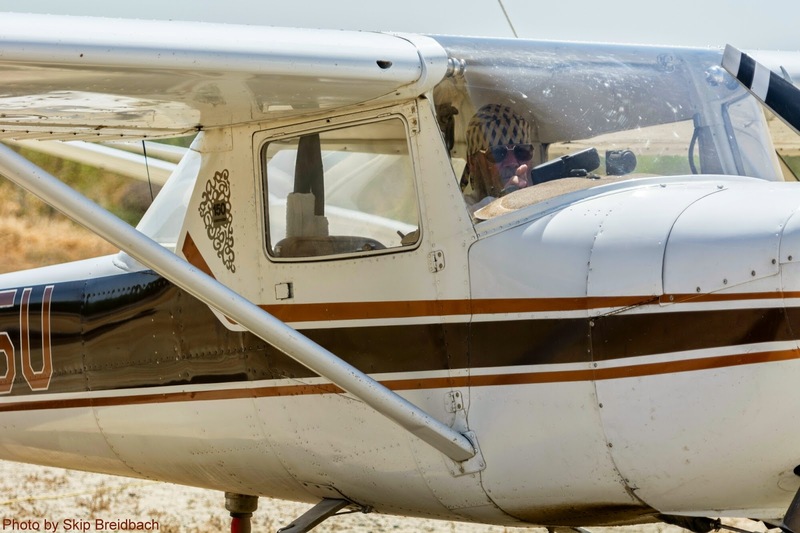 Ethan Morris had to wait until the afternoon to go on a flight with Jeff Richardson in the Orange Crush but the wait was worth it and he could head home knowing he had flights in two different kinds of aircraft to his credit. His Dad, Gary, was always around and just as happy to see Ethan fly as he might have been to have flown as well. 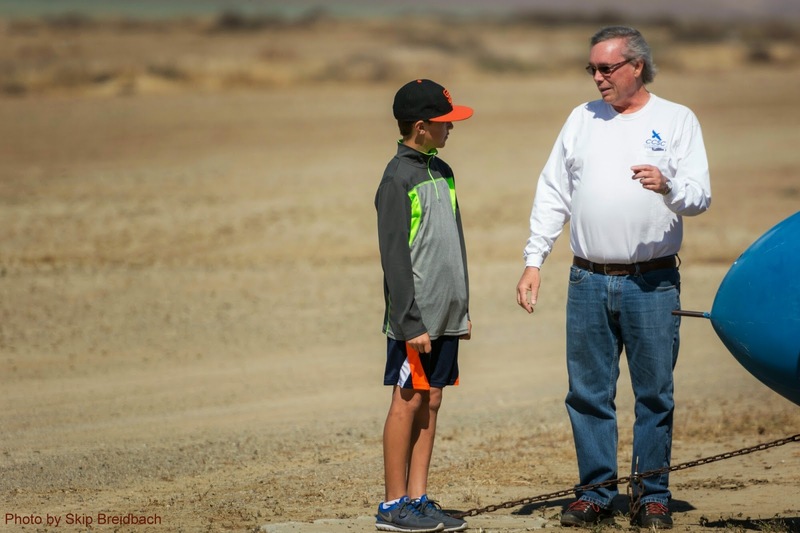 Dad, Gary Morris, watches as son, Ethan, boards the Orange Crush with Jeff Richardson. 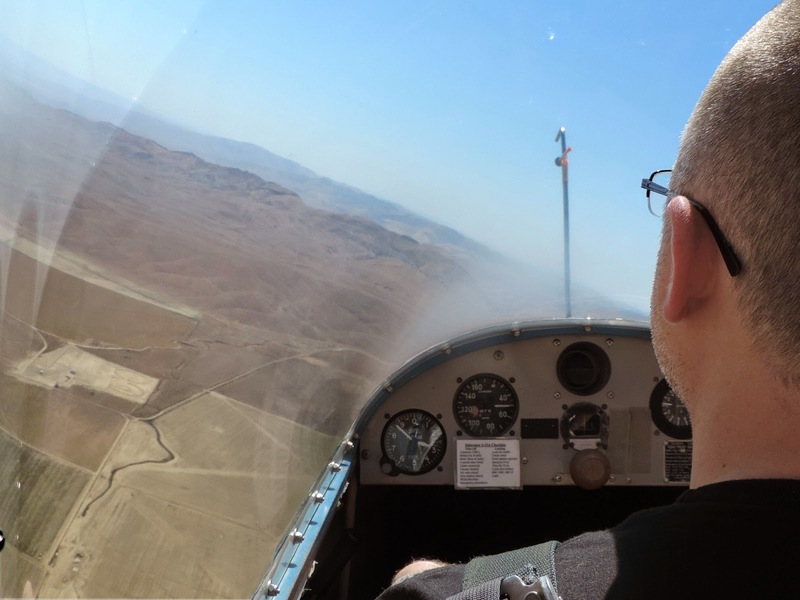 Earlier in the day, I talked to Carl Engel who told me of his plans to fly the highest, the farthest, and stay up the longest. It was a good day to try but his attempt seemed a bit out of reach from our vantage point on the ground. Nevertheless, Carl is the kind of guy that won't take no for an answer and he made all the necessary preparations for his goals. Carl preparing the Russia for his great flight fulfilling his goals. 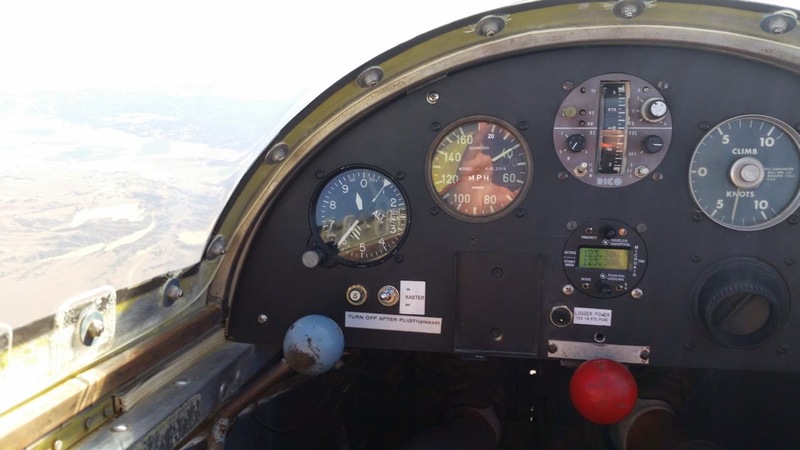 Click on the photo to see in more detail on the altimeter showing 11,000 msl. 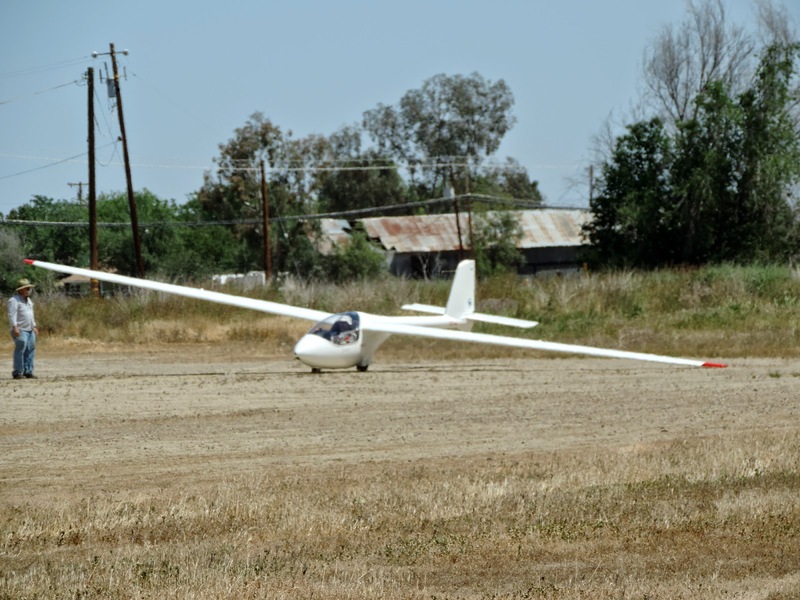 After seeing the promising forecast (though not as good as Sunday or Monday) and being able to have the Russia to myself all day Saturday, my goal was to leave the comfort of staying within gliding distance of Avenal and take on my first cross-country flight. My stretch goal was to complete all 3 parts of the Silver Badge as well (not officially documented, however): 50km distance, 1000m altitude gain, and 5 hours duration. My plan was to get to Black Mountain, get high and stay high while working my way Northwest for a 50km+ out and back flight. 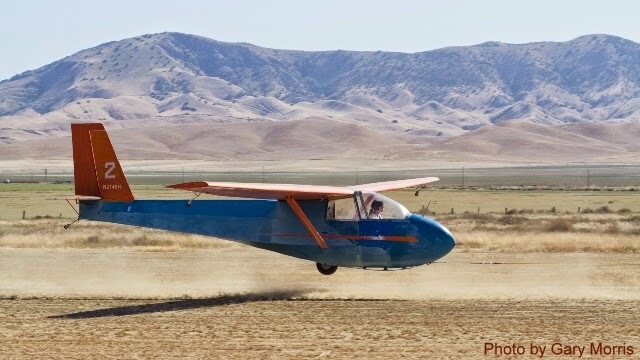 To simplify a possible retrieve and minimize chances of any damage from landing out, I decided to stay within glide of another 'real' airport, namely New Coalinga. 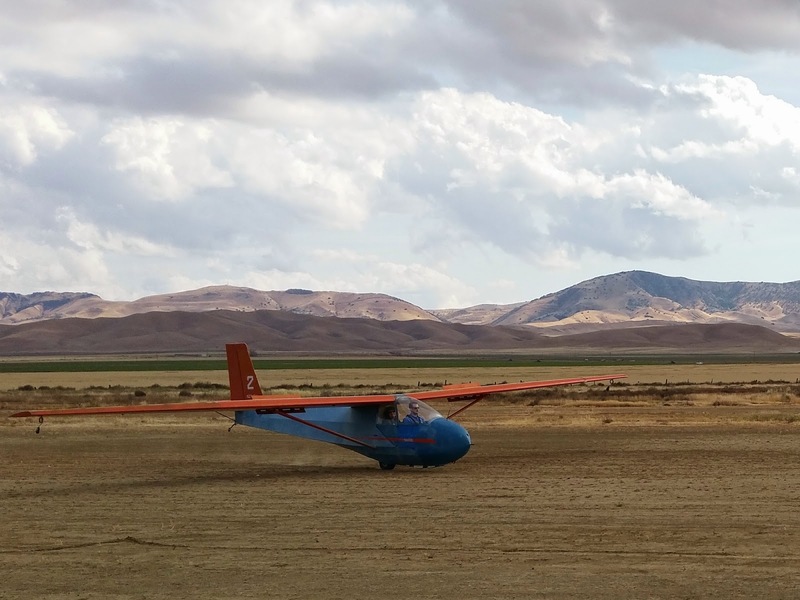 I launched at about 1:45 and spent an hour hunting thermals around the airport, trying to get enough altitude to punch through a swath of heavy sink that set up between the gliderport and the mountains. Once over Black and at 8,000 msl, I proceeded Northwest, flying in and out of unmarked convergence (I think), stopping for a strong thermal here and there. 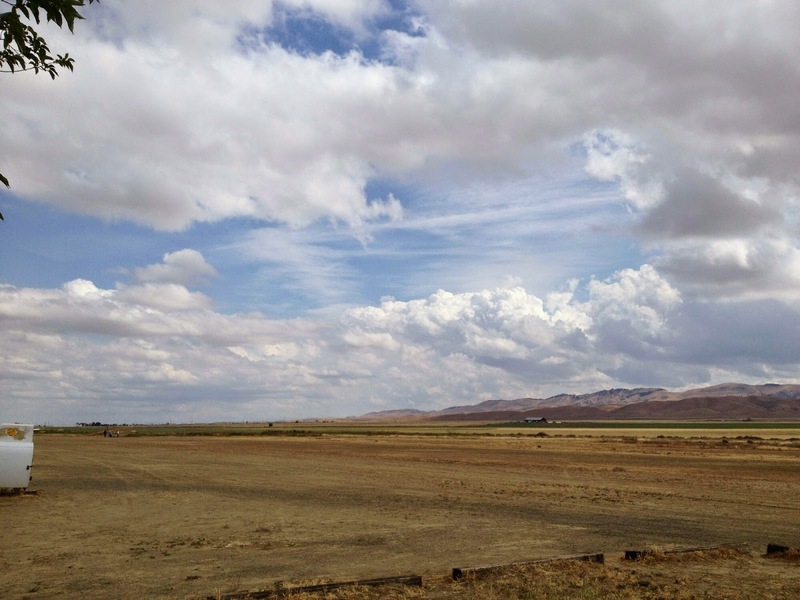 The moment that XCSoar declared Avenal out of glide and I set it to track New Coalinga instead, several thoughts/emotions ran through my head concurrently: exhilaration, freedom, and a bit of 'what have I gotten myself into? 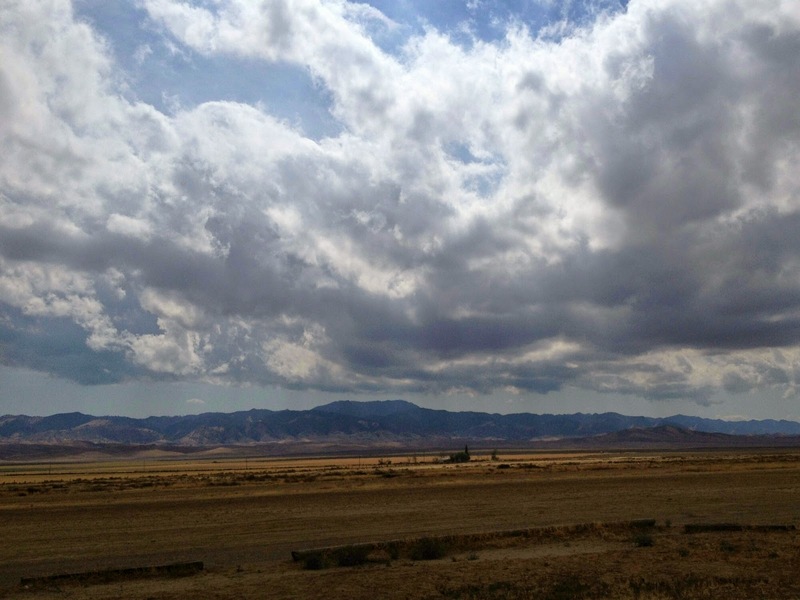 I pressed on, and several miles later found myself nearing the border of staying within glide of New Coalinga. Having exceeded my 50km goal, I turned back, and shortly found myself in some strong sink (the 'what have I gotten myself into?' thought returned), then found the sink's corresponding lift, taking me over 11,000 msl. With that, I again had plenty of margin, went North another couple miles, then made my way back the way I came. I headed down to 41/33 and back to Black to finish off the 5 hours. I landed just shy of 7pm and was greeted by Bart and Jim who had stayed in case I needed a retrieve, thanks to them! I've attached a few pictures: one of the instruments as I passed through 11,000', another of the wing leading edge peppered with bugs after the flight (I cleaned it before the flight, I swear! 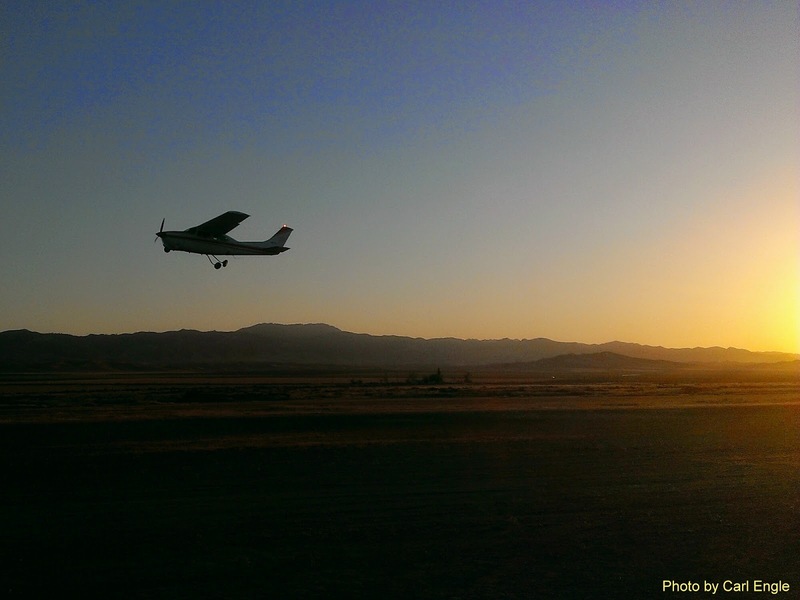 ), and another of Jim taking off at sunset after making sure I got back to Avenal ok.
Fun to think that it was just a year ago that I passed my check ride! He swears he removed all the bugs before takeoff but look at them all now. Jim Rickey on his way home after waiting around for Carl just in case he was needed. Now it is Jaimie Strickland's turn for a training flight. It was a rough air day and Jaimie hadn't flown for a couple of weeks but her skill set returned and she managed to do all of the tow. 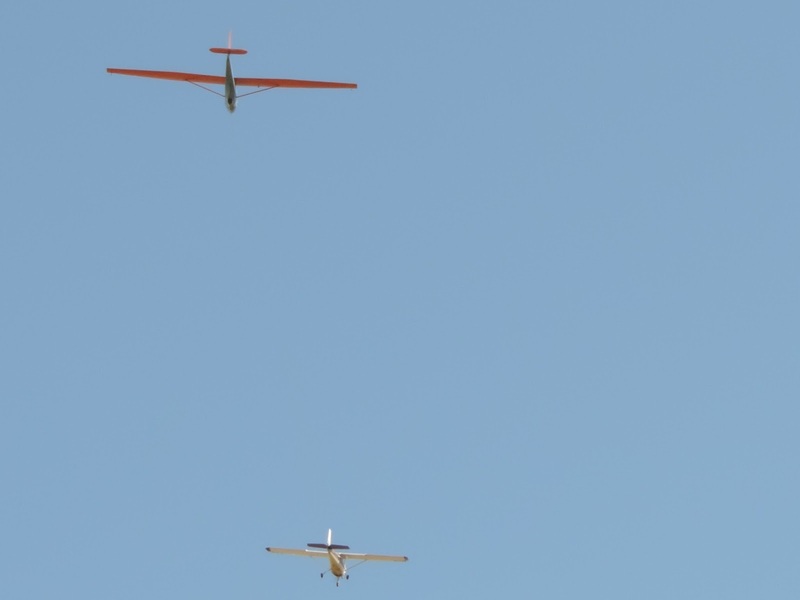 Off tow, we accomplished several maneuvers including stalls both straight and turning, and she had ample practice to thermal, thus gaining more experience in stick rudder coordination. After waiting several hours, Jaimie is finally ready to go flying. 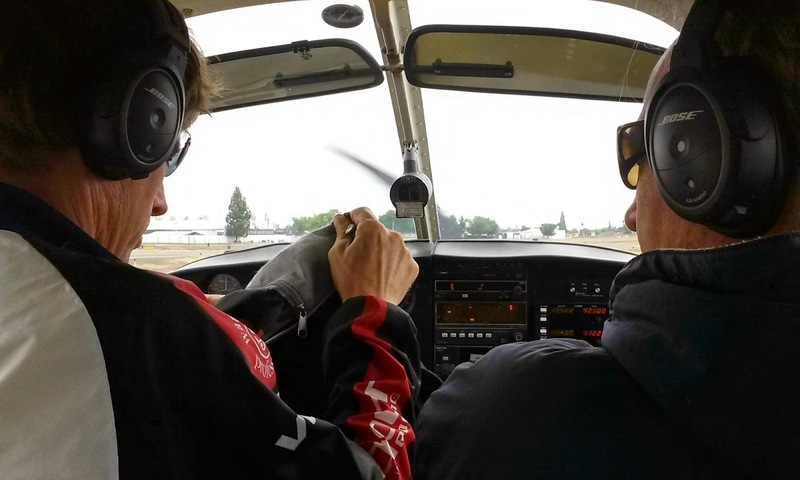 The rope is taut, the tow plane is ready, and so is Jaimie, who does an excellent takeoff. Up in the air, off tow, she's in her element as we all are when the air is rough. 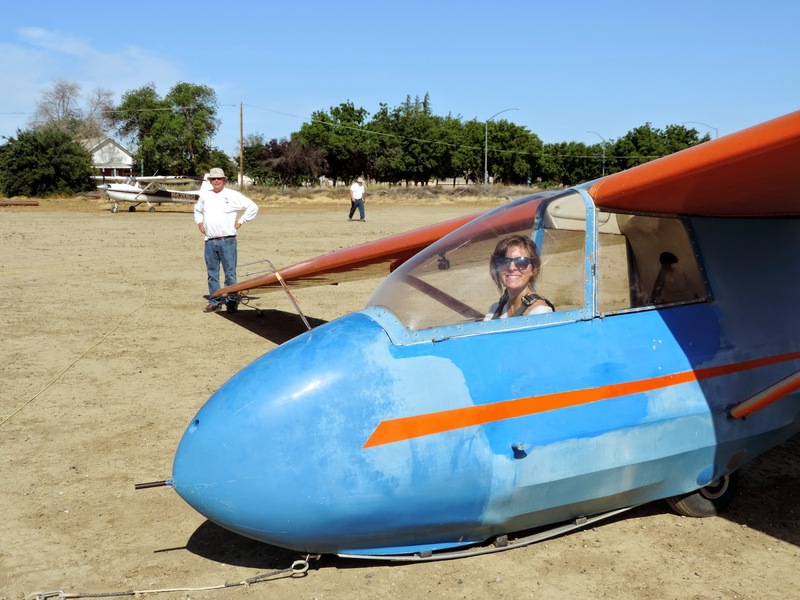 Jennifer Bauman has been patiently waiting all day for her turn to fly in the anticipation that she might solo today. 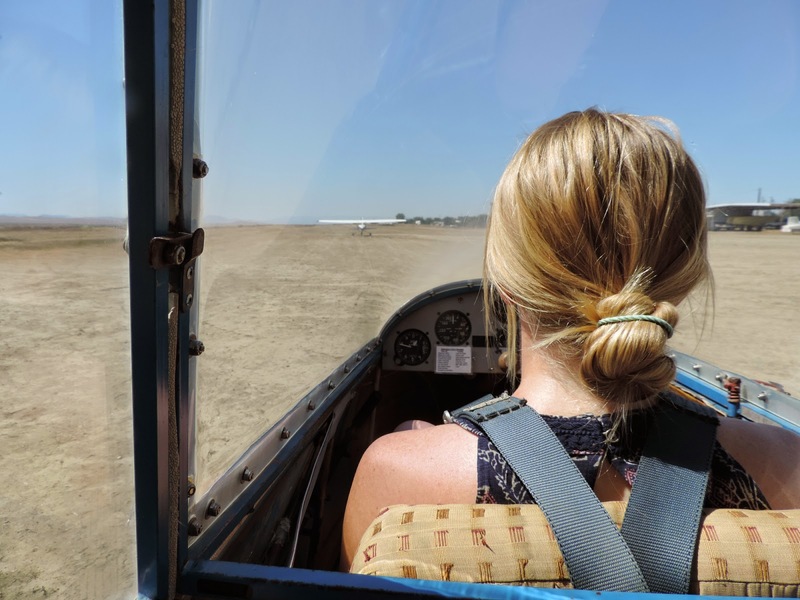 I'm sure it was a bit of an anxiety-producing wait, and she was nervous, rightfully so, since she hadn't flown any aircraft for many months prior to her beginning her glider training. 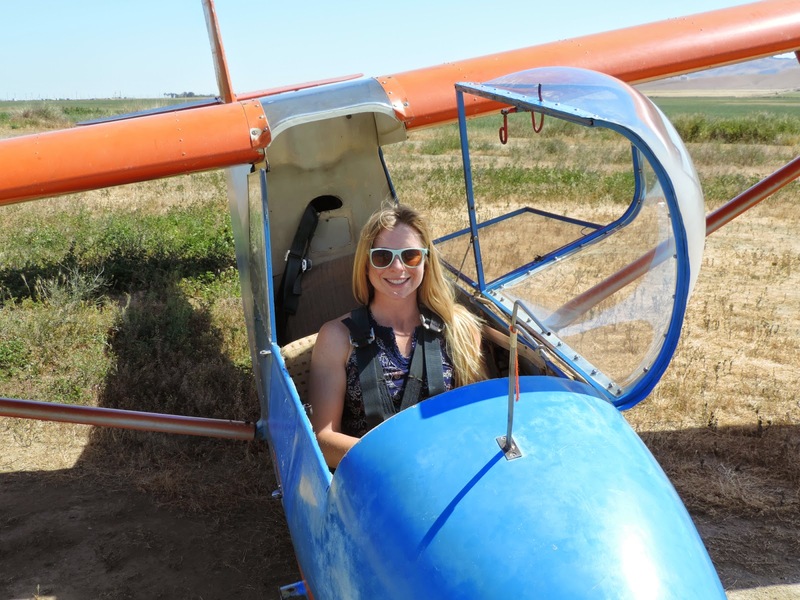 Even though she is a licensed power pilot, flying gliders is another realm. But after two flights with me, it became apparent that she was ready to solo. The air was rough on tow, but she handled it correctly and safely. So, the solo time is here. Now she settles down and is determined to make it a very good three-flight series, which she accomplished. 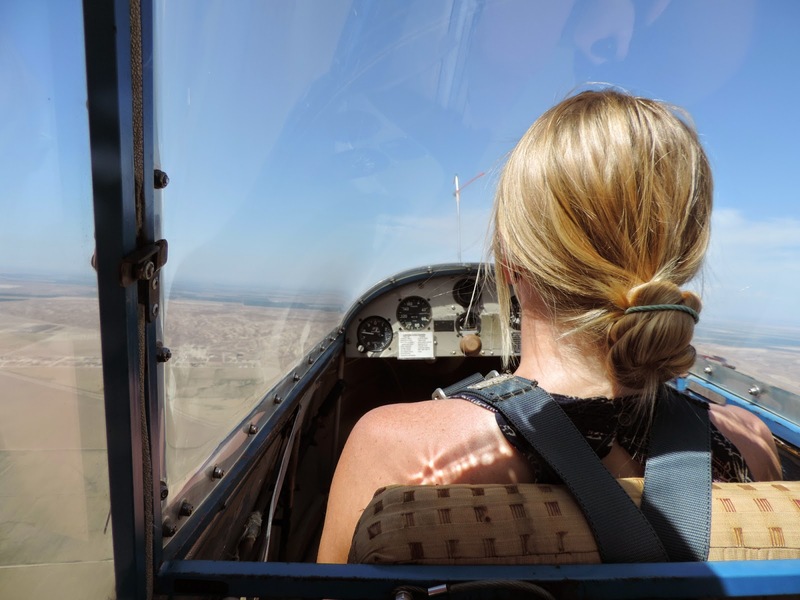 As she admitted, her patterns were better alone than with her flight instructor, although she admitted to hearing my voice while she flew all three flights. I think anyone with a camera must have taken pictures of her solo and now here are only about half or less of those submitted to me. Although nervous, she is confident and ready to show she deserves to solo. 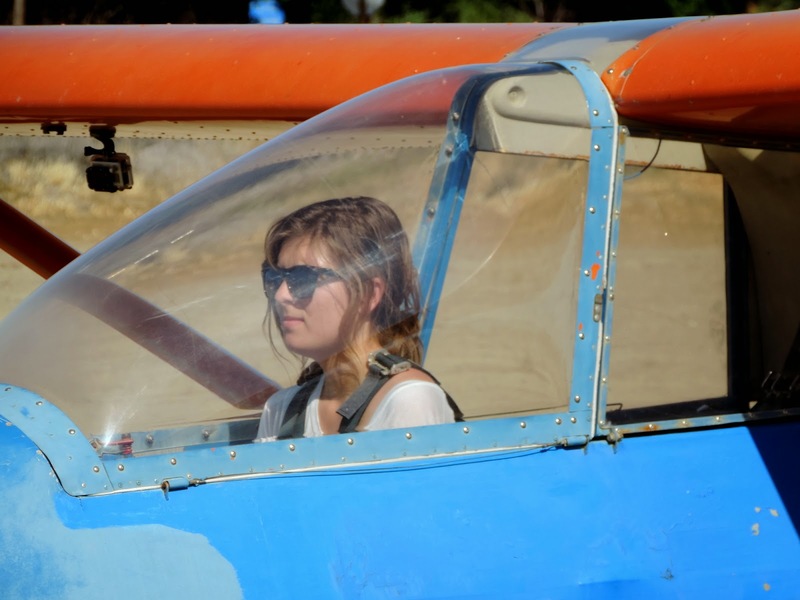 One last look at her Flight Instructor and her focus is on the launch. Look closely and you'll see a very determined pilot in the front seat, alone. Nothing is going to interfere with her flight performance at this time. Another angle on her first solo launch. On tow and just the right height above ground behind the tow plane. Looking good for Jennifer's first glider solo. Nearing the IP and about to release off tow for the first time. 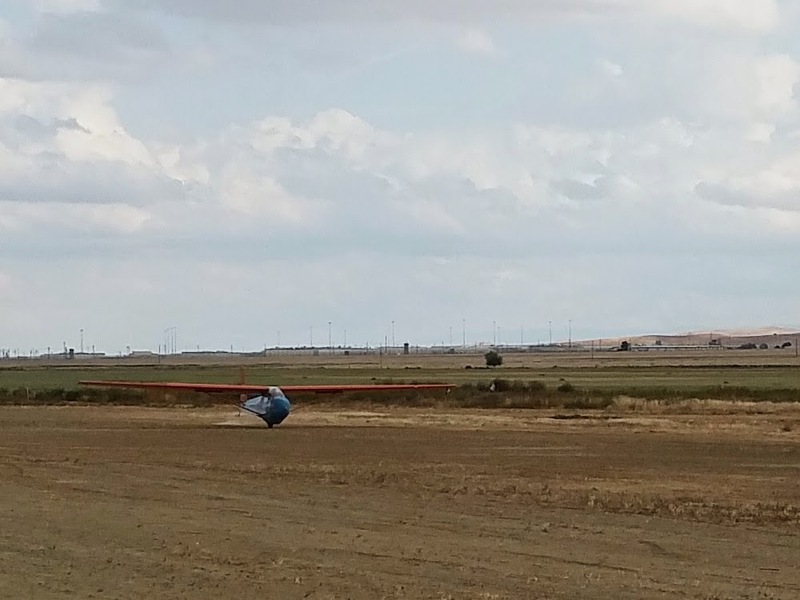 Jennifer's first solo glider landing. Well done. 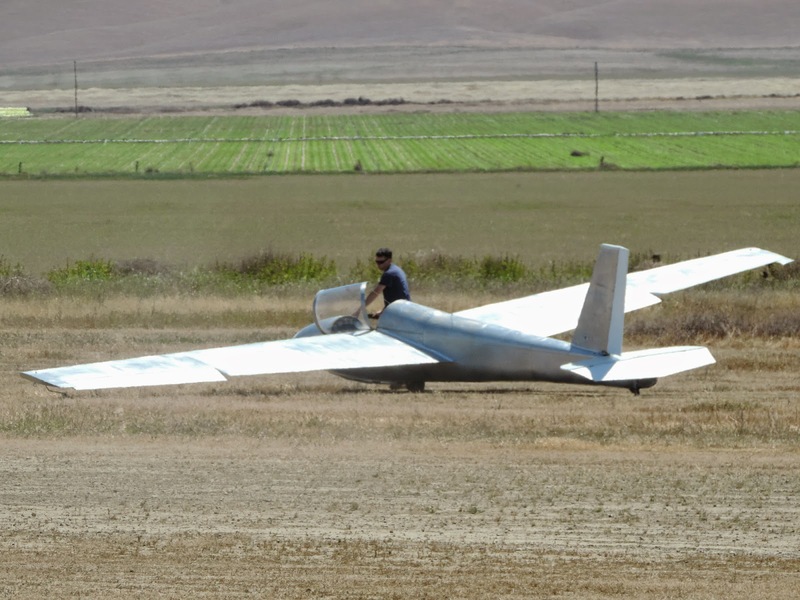 She had a lot of help moving the glider back to the launch area for her second flight. Overhead near the IP and maneuvering for a pattern entry. About to make her second solo landing. Note the tow plane in the upper left corner. Nice approach to her second landing, and enough energy to return to the launch end. 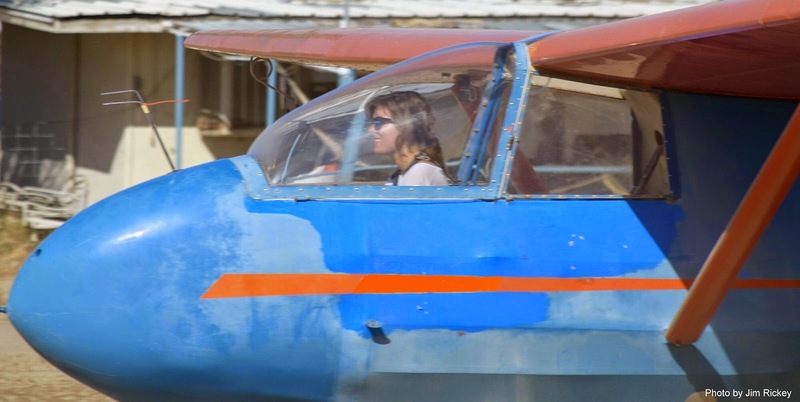 This time she's smiling, knowing that she made it, soloed, and has a great glider career ahead. 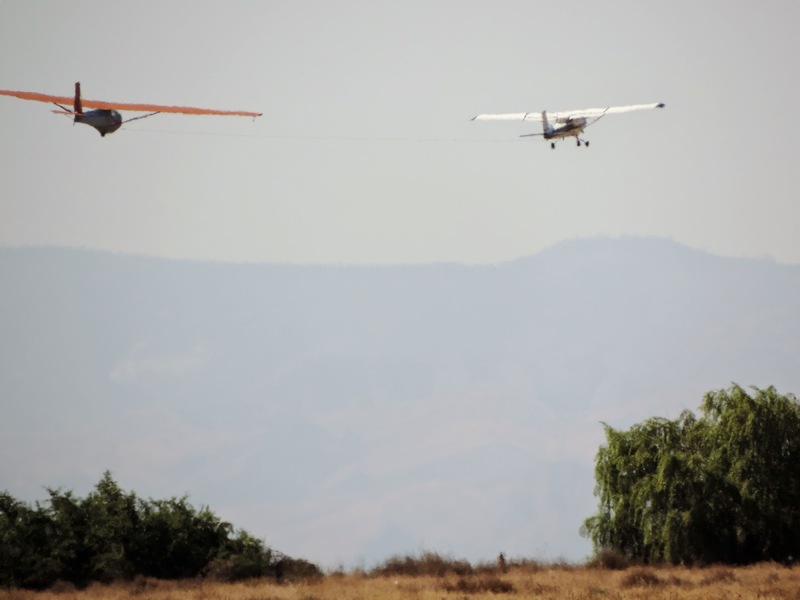 A great photo by Jim, positioning both aircraft in the picture, on final. 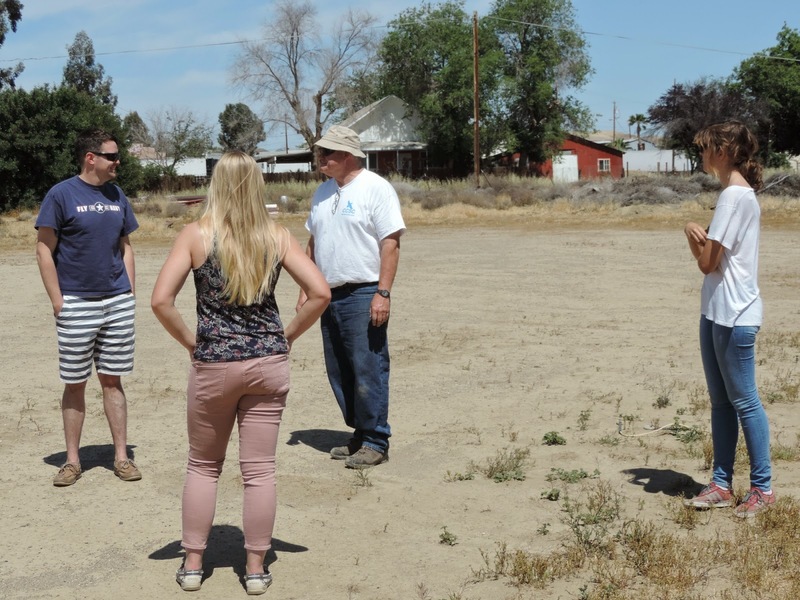 The Avenal tradition begins with losing one's shirttail. She wore an especially old and disposable T-shirt for the occasion. CONGRATULATIONS JENNIFER ON THREE EXCELLENT FLIGHTS. Windy in back but she had another shirt with her so her air conditioning didn't last long. 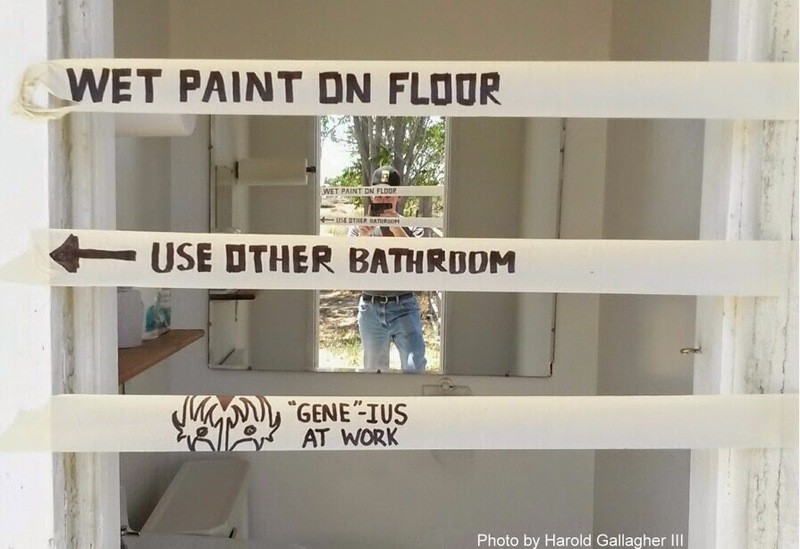 Harold Gallagher III had another clubhouse project in mind even last week when we left Avenal. 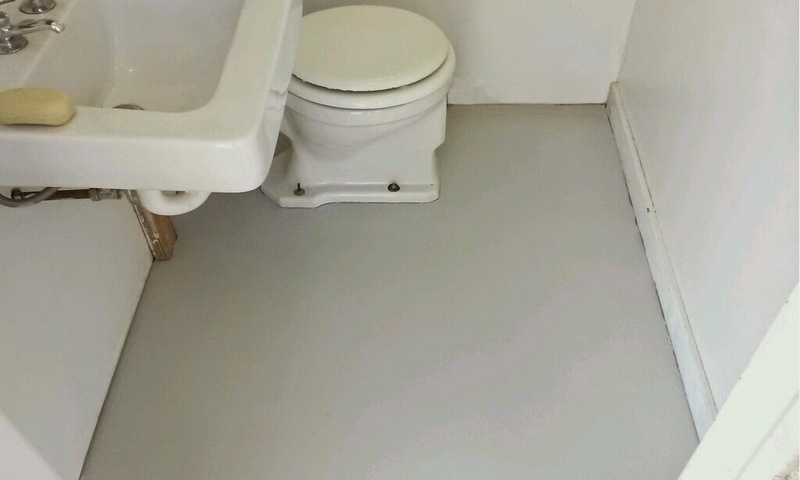 So, after buying all the supplies, he announced that the floor of the east bathroom was going to be made new again. Sure enough, when he got done, the floor did indeed look like it must have been many years ago. Thanks to him, the clubhouse and facilities have never looked better. 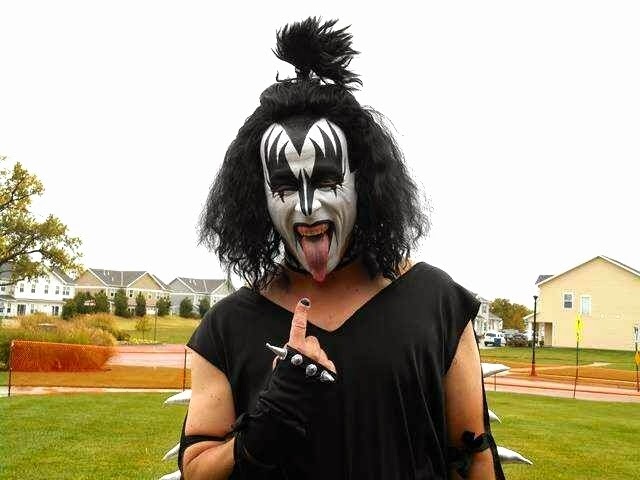 The drawing to the left of "GENE" is from the rock band, KISS, his favorite. 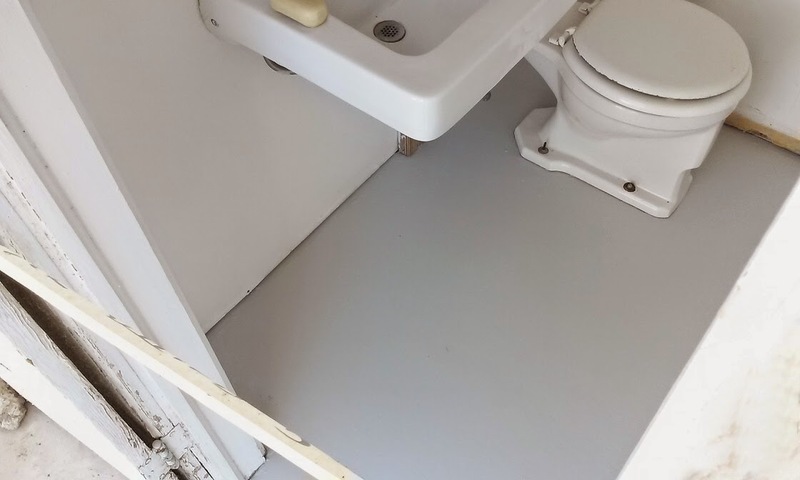 Nothing like three coats of floor enamel to improve the look of this bathroom. Skip Breidbach is an excellent photographer. He's one of those guys who sees ordinary scenes and takes extraordinary pictures of them. 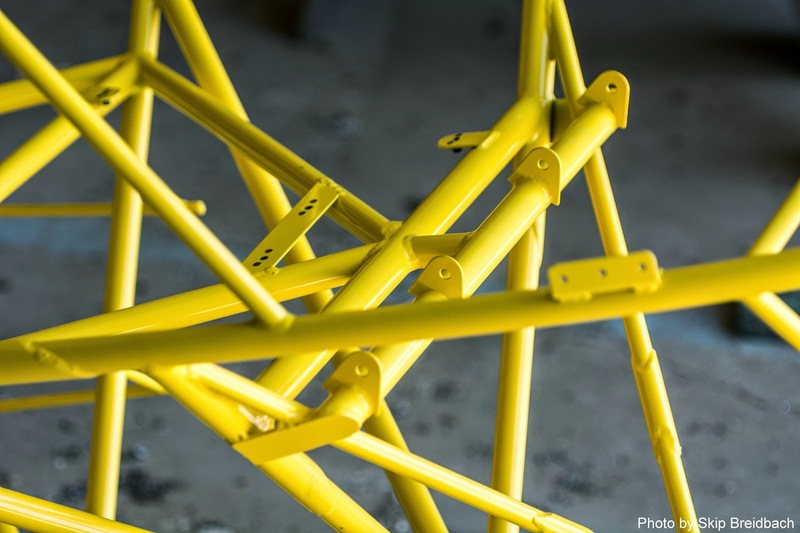 The photo below was taken of our newly refurbished Big Bird fuselage tubing structure. But it looks like a modern painting and he purposely took it that way. Really well done but I would expect nothing less from this talented guy. End of a long, but fruitful day for most of those who came out to fly.